Born Florence Margaret Schust on May 24, 1917, in Saginaw, Michigan, she was the daughter Frederick Schust, who ran a family baking company. 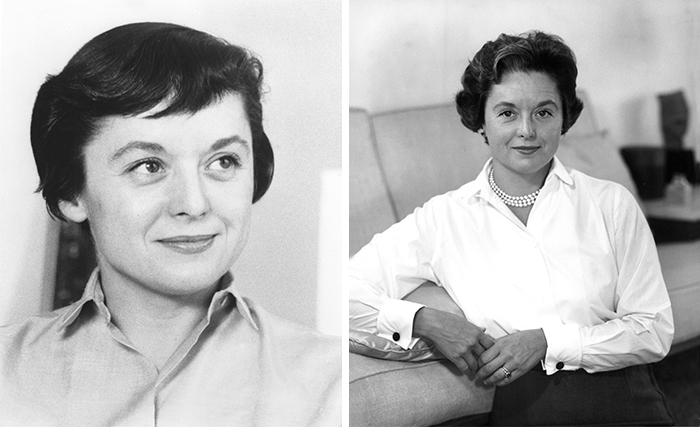 Known throughout her life by her friends as “Shu,” Florence Knoll Bassett’s rise to the top of the design world began in tragedy, when she was orphaned at age 12. Fortuitously, her guardian brought her on a tour of possible boarding schools, among them the recently opened Kingswood School for Girls in Bloomfield Hills, Michigan. The school was designed by Finnish architect Eliel Saarinen; at the time, he was also headmaster of the associated Cranbrook Academy of Art. The young Florence Schust was struck by the school’s beauty and instantly decided it was the place for her. At Kingswood, Ms. Knoll Bassett developed an interest in architecture, and she caught Eliel Saarinen’s attention. Over time, Ms. Knoll Bassett became an extended part of the Saarinen family, which included the son Eero Saarinen, who would go on to become a distinguished architect. The Saarinens invited her to join them on trips to Europe and summer visits to their home outside of Helsinki, and Ms. Knoll Bassett and Eero Saarinen became lifelong friends. She would later commission him to design a collection of groundbreaking furniture for Knoll. Upon graduating from Kingswood, Ms. Knoll Bassett stayed on in Bloomfield Hills to study at the Cranbrook Academy of Art, at Eliel Saarinen’s recommendation. It was the beginning of her years of serious design training. In 1935, she enrolled in the planning program at Columbia University’s school of architecture. She returned to Cranbrook the following year and went on to study at the Architectural Association in London. The outbreak of World War II brought Ms. Knoll Bassett back to the United States where she completed her formal training in Chicago at the Armour Institute of Technology, now the Illinois Institute of Technology. During her advanced schooling and extended travels, Ms. Knoll Bassett met many of the leading architects of the time, including Alvar Aalto, Marcel Breuer, Walter Gropius and Ludwig Mies van der Rohe. 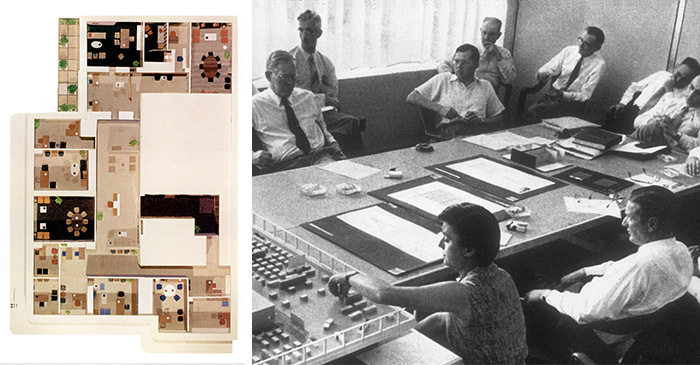 Some of these early mentors would come to figure prominently in her future work at Knoll. But it was Mies who had perhaps the clearest influence on her signature approach to design: rigorous and methodical. In addition to expanding the furniture line through her own designs and a series of commissions from the period’s leading designers, Ms. Knoll Bassett launched a textile program to fill another gap she perceived in the market. The program, the beginning of KnollTextiles, brought Ms. Knoll Bassett to another advancement in industry practice. Her use of small fabric swatches in client presentations led her to develop a tagged sample and display system that became an industry standard. In this period, Hans Knoll’s global vision of the company was coming to fruition, as Knoll expanded with offices in Belgium, Canada, France and Switzerland. Under Ms. Knoll Bassett’s vigilant stewardship, the company also developed a distinctive graphic identity, working with Herbert Matter, who designed everything from advertisements and stationery to the company’s mark. And because Ms. Knoll Bassett was determined that the company’s design approach be seen as accessible and broadly applicable, Matter-designed ads appeared in general interest publications like The New Yorker and Fortune, expanding awareness of Knoll outside the industry. Ms. Knoll Bassett’s influence on the “total design” sensibility of Knoll cannot be overstated. In 1955, her life was struck by a second tragedy when Hans Knoll was killed in an automobile accident. Ms. Knoll Bassett suddenly found herself as Knoll’s sole owner. 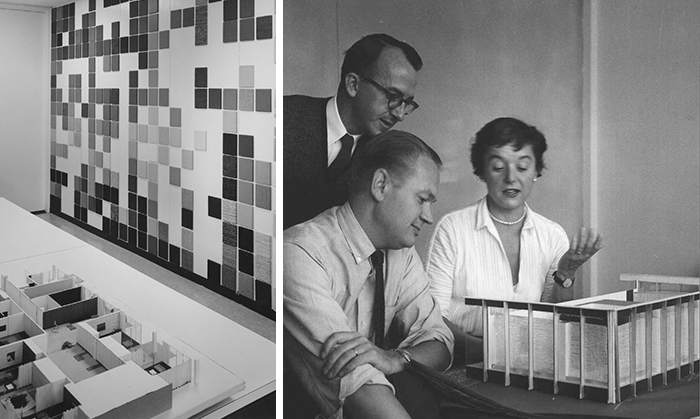 Despite initial speculation that the groundbreaking efforts of the company would diminish as a result of so great a loss, Ms. Knoll Bassett continued to run the Knoll Planning Unit and oversaw all design related aspects of the company, including showroom designs, marketing and advertising. 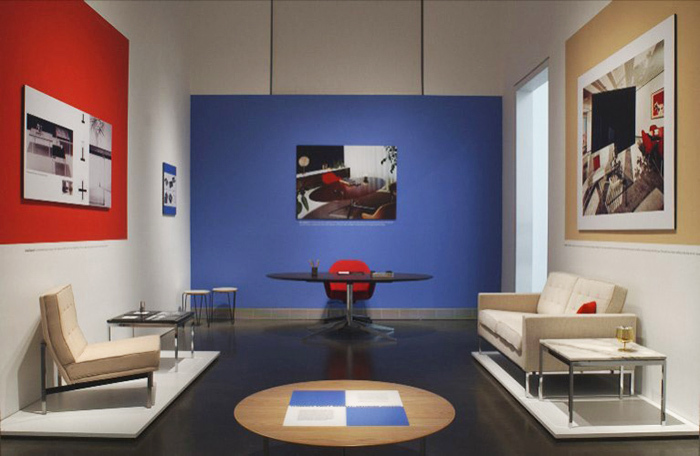 The 2004 exhibition “Florence Knoll Bassett: Defining Modern” at the Philadelphia Museum of Art showcased Ms. Knoll Bassett’s designs. Like her teacher and friend Ludwig Mies van der Rohe, Ms. Knoll Bassett’s attention to detail was all-encompassing, relentless, and, over time, the stuff of legend. Even at 87, working with curator Kathryn Hiesinger to prepare an exhibition of her work at the Philadelphia Museum of Art, her instructions were precise and painstaking. “Nothing was left to chance,” Ms. Hiesinger recently recalled, describing her admiringly as a “perfectionist.” Even though it was a small show (one room), Ms. Knoll Bassett made her own “paste-up” cardboard model of how she envisioned the space. 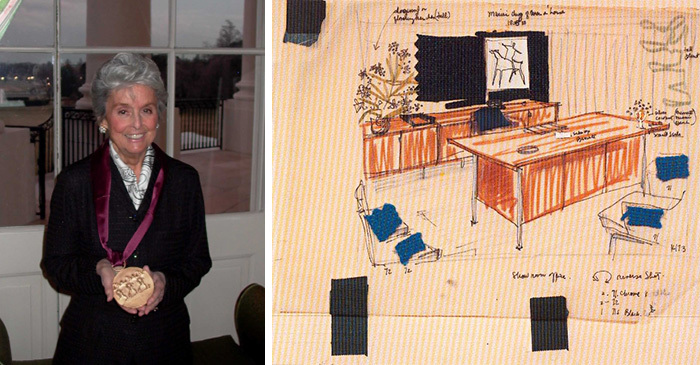 The paste-up—a visual planning technique that she had used while designing at Knoll—featured folding walls and drawings of the furniture she selected and fabric samples of the upholstery, all accompanied by detailed notes that covered every aspect of the exhibition design. She traveled from Miami to New Haven to approve printed materials and, more than once, to Philadelphia to check on installation details. However, she did not attend the exhibition opening. “She was not interested in public performance of that sort,” said Ms. Hiesinger.